The evidence of the use of mathematics in the Old Kingdom (c. 2690–2180 BC) is scarce, but can be deduced from inscriptions on a wall near a mastaba in Meidum which gives guidelines for the slope of the mastaba. The lines in the diagram are spaced at a distance of one cubit and show the use of that unit of measurement. 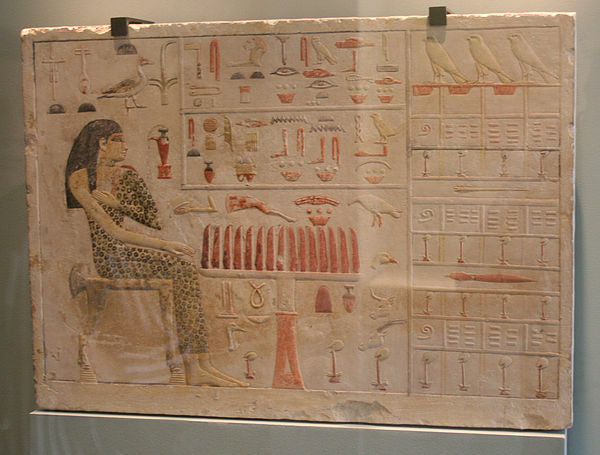 The earliest true mathematical documents date to the 12th dynasty (c. 1990–1800 BC). The Moscow Mathematical Papyrus, the Egyptian Mathematical Leather Roll, the Lahun Mathematical Papyri which are a part of the much larger collection of Kahun Papyri and the Berlin Papyrus 6619 all date to this period. The Rhind Mathematical Papyrus which dates to the Second Intermediate Period (c. 1650 BC) is said to be based on an older mathematical text from the 12th dynasty. The Moscow Mathematical Papyrus and Rhind Mathematical Papyrus are so called mathematical problem texts. They consist of a collection of problems with solutions. These texts may have been written by a teacher or a student engaged in solving typical mathematics problems. as a sum of unit fractions. During the New Kingdom (c. 1550–1070 BC) mathematical problems are mentioned in the literary Papyrus Anastasi I, and the Papyrus Wilbour from the time of Ramesses III records land measurements. In the workers village of Deir el-Medina several ostraca have been found that record volumes of dirt removed while quarrying the tombs. The Rhind Mathematical Papyrus (RMP), dated from the Second Intermediate Period (c. 1650 BC), but its author, Ahmes, identifies it as a copy of a now lost Middle Kingdom papyrus. The RMP is the largest mathematical text. The Papyrus Anastasi I, a literary text written as a (fictional) letter written by a scribe named Hori and addressed to a scribe named Amenemope. A segment of the letter describes several mathematical problems. Ostraca from Deir el-Medina contain computations. Ostracon IFAO 1206 for instance shows the calculation of volumes, presumably related to the quarrying of a tomb. denotes the intermediate results that are added together to produce the final answer. ^ a b c d e Imhausen, Annette (2006). "Ancient Egyptian Mathematics: New Perspectives on Old Sources". The Mathematical Intelligencer. 28 (1): 19–27. doi:10.1007/bf02986998. ^ a b c Burton, David (2005). The History of Mathematics: An Introduction. McGraw–Hill. ISBN 978-0-07-305189-5. ^ Rossi, Corinna (2007). Architecture and Mathematics in Ancient Egypt. Cambridge University Press. ISBN 978-0-521-69053-9. ^ a b c d e f g Katz V, Imhasen A, Robson E, Dauben JW, Plofker K, Berggren JL (2007). The Mathematics of Egypt, Mesopotamia, China, India, and Islam: A Sourcebook. Princeton University Press. ISBN 0-691-11485-4. ^ Reimer, David (2014-05-11). Count Like an Egyptian: A Hands-on Introduction to Ancient Mathematics. Princeton University Press. ISBN 9781400851416. ^ Moore, Deborah Lela (1994). The African roots of mathematics (2nd ed.). Detroit, Mich.: Professional Educational Services. ISBN 1884123007.